Jobie Banks was living in a correctional facility when its physicians failed to diagnose and properly treat his diabetic feet. As a result, he was forced to undergo an amputation of his left leg to the knee. As he was going through this painful and traumatic time, he was fortunate enough to be referred to Hill & Moin. From the very first conversation he had with Melisande Hill and Cheryl Moin, Mr. Banks “had a good feeling.” He knew he had found the right firm to represent him. 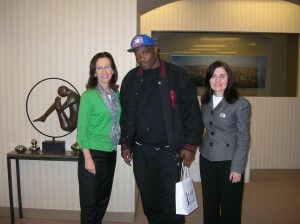 Mr. Banks found the staff and attorneys extremely helpful. “Anytime I needed answers to questions, they were there for me.” He felt he was well prepared for his deposition, and because the “attorneys explained what to expect,” he felt very comfortable. This entry was posted on Saturday, January 12th, 2013 at 11:49 am and is filed under Our Clients Speak. You can follow any responses to this entry through the RSS 2.0 feed. Both comments and pings are currently closed.